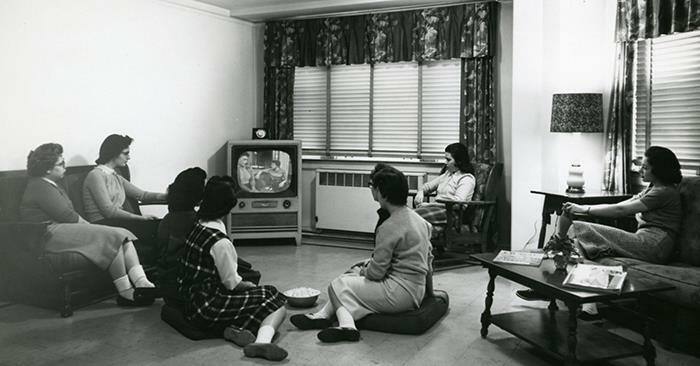 Students watch television in a residence hall lounge circa 1959. Photo courtesy of the Special Collections Department in Pickler Memorial Library. Truman has always been known as a residential campus, but that does not mean students always resided on campus. In the early days, most students lived off campus. Grim Hall was a residence for a long period of time, but it was primarily housing for nurses when it opened in 1923. According to “Founding the Future: A History of Truman State University,” campus housing began in 1947 when the University received a grant to convert nine army barracks to campus apartments. 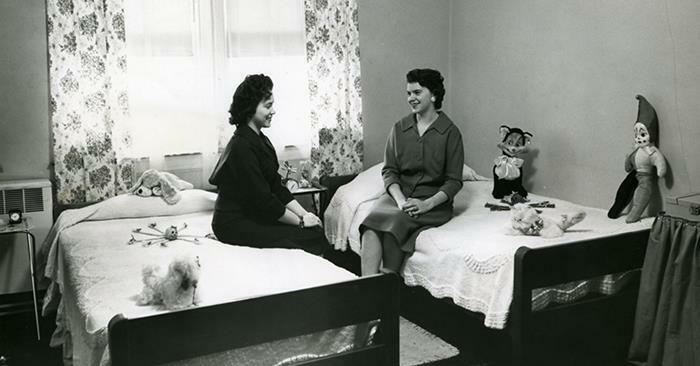 By the 1950s, most men still lived off campus, and the residence halls were occupied by women. The 1960s saw a boom in residence hall construction. 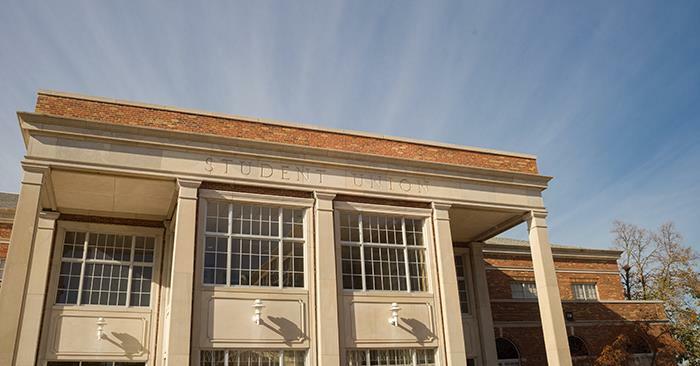 Five buildings opened during that decade, starting with Dobson Hall in 1961 and ending with Centennial Hall in 1967. After that, it would be another 39 years before a new residence hall, West Campus Suites, would be built. Since that time, all of the residence halls have undergone renovations. During an average year, 98 percent of freshmen live on campus, and a total of more than 2,800 students occupy the residence halls. Students in their dorm room in the BNB complex circa 1959. Photo courtesy of the Special Collections Department in Pickler Memorial Library. Truman’s forensic union (speech and debate team) went to two different tournaments the weekend of Nov. 11-12. Four debaters traveled to the Redbird Swing hosted by Illinois State University, and seven speech competitors went the City of Cedars/Forensic Roots tournament at McKendree University. Even when split at separate tournaments, the team continued its successful fall semester. At the Redbird Swing, the four debaters joined forces to take home third place debate sweepstakes, Nov. 12, and third place overall debate sweepstakes for the weekend. Senior debater Kelsey Barnes advanced to Lincoln-Douglas quarterfinals in the varsity division, Nov. 11. She was also named fifth best speaker in the division. First-year Maguire Radosevic also made it to elimination rounds, finishing as an octafinalist in the varsity division and was named second best speaker in the same division. On Nov. 12, Barnes returned to quarterfinals and Radosevic was named the overall top novice speaker. At the City of Cedars/Forensic Roots, sophomore Austin Sopko and first-year Audrey Baker placed sixth in duo interpretation, Nov. 11. Baker also was named the top novice in persuasive speaking. The following day, Sopko and Baker placed fifth in duo. Baker placed sixth in persuasive speaking and was once again named top novice in the event. This means that Baker has qualified her persuasion to nationals, her third national qualification of the year. Baker was also named top novice in dramatic interpretation. Finally, first-year Travis Stahlman was named top novice in informative speaking. Truman forensics will return for one more fall tournament with the Cameron Christmas Classic in Lawton, Okla., hosted by Cameron University the first weekend of December. Participation in the forensics program is open to any Truman student in good standing, regardless of prior speech and debate experience. For more information on how to get involved, visit forensics.truman.edu or contact Christopher Outzen, director of forensics, or Craig Hennigan, assistant director of forensics. All December graduates are invited to the Graduating Students Pizza Party sponsored by the Truman Alumni Association from 11:30 a.m.-1:30 p.m. Dec. 13 in the Student Union Building Georgian Rooms. Stop by the pizza party for a complimentary meal of pizza, veggies, drinks and cookies. Vegetarian, vegan and gluten-free options are available on request. This will be an opportunity for students to pick up other gifts such as their first official Bulldog Forever alumni T-shirt. Those students who cannot attend may stop by the Office of Advancement, located in McClain Hall 205, after Dec. 11 to pick up their T-shirt and goodie bag. T-shirts will also be given out at commencement, immediately following the ceremony. 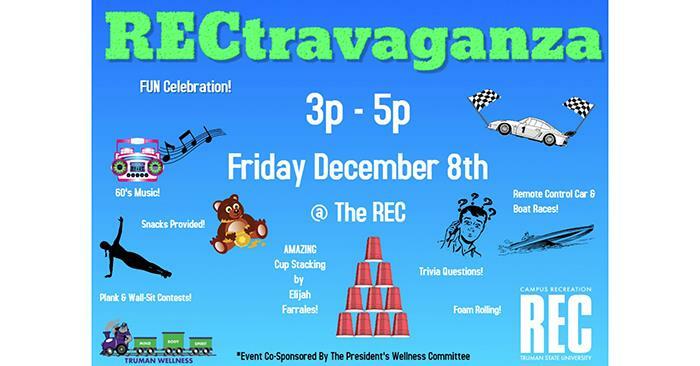 Questions regarding the pizza party, goodie bags or T-shirts can be directed to Jordan Smith, coordinator of alumni relations, or check out the Facebook event. 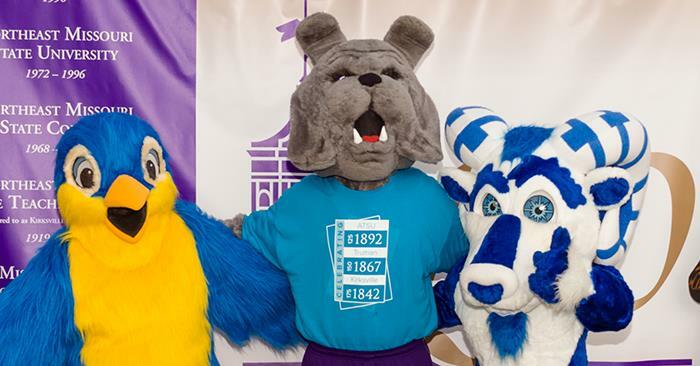 Orientation welcomes and introduces all first-year students and their families to Truman throughout the month of June and a late session in August. Orientation leaders have access to benefits such as impactful professional experience, a deeper understanding of the University, provided room and board (if needed) and a $1,500 taxable stipend. Applications are open now and are due Dec. 20. To read the full job description and to apply, visit truman.edu/ol or contact orientation coordinator, Shari Fieser with any questions. Lúnasa and guest soloist Ashley Davis will team up to set the mood for the holidays with traditional Irish tunes. “Christmas from Ireland,” this season’s holiday program from the Kohlenberg Lyceum Series, will take place at 7:30 p.m. Dec. 6 in Baldwin Auditorium. With some of the top musical talents in Ireland, Lúnasa indeed lives up to its name – drawn from an ancient Celtic harvest festival that honors the Irish god Lugh, patron of the arts. The band is known for its innovative and distinctive sound, featuring champion instrumentals and a driving rhythm section. 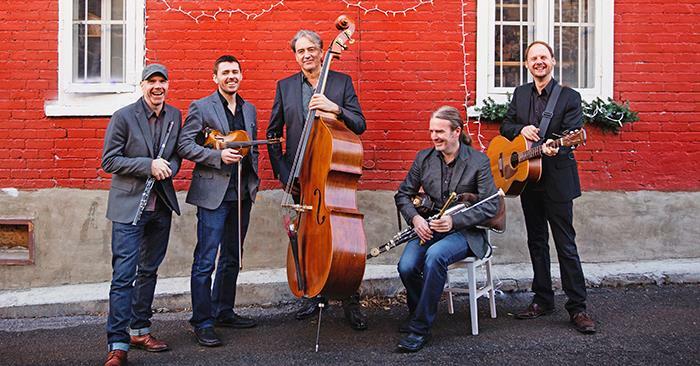 After performing for more than 20 years, Lúnasa has raised the bar on performing traditional Irish music. Tickets are on sale now and may be purchased online at lyceum.truman.edu or at Edna Campbells in downtown Kirksville. They are also available at the cashier’s window, located on the first floor of McClain Hall, between 10:30 a.m. and 3:30 p.m. Monday-Friday. All tickets are $5.50 (includes tax). Questions about the Kohlenberg Lyceum Series can be directed to pr@truman.edu or by calling 660.785.4016. Follow the series on Facebook for announcements regarding all lyceum events. Truman is offering a new study abroad opportunity to learn about the history and contemporary events in Cuba. Only 90 miles from the United States, Cuba has remained a forbidden territory for most U.S. citizens since the Revolution of 1959. Cuba is a former Spanish colony and sugar-producing slave society, and one of the last countries of Latin America to achieve independence from Spain in 1898. Between 1898 and 1959, the U.S. held an outsized influence on the island. 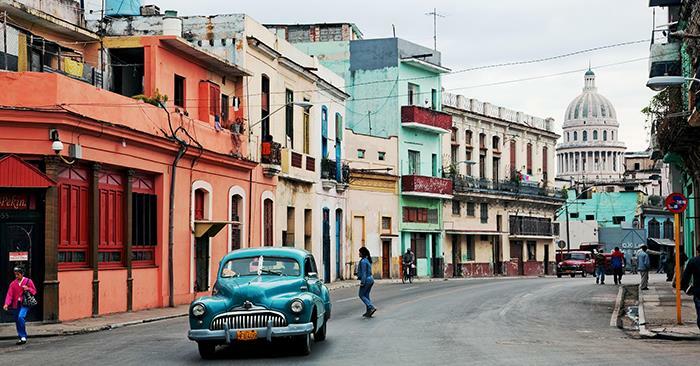 In 1959, Cuban was the site of the hemisphere’s first successful socialist revolution. While most people in the U.S. know little about Cuba today, Cubans are acutely aware of the United States and the long-intertwined history between the two countries. During the midterm break, March 10-18, students will have a unique opportunity to travel to Cuba to take a close look at issues of global economics, conflict and peace, race, culture, the environment and U.S. relations. Participants will examine Cuban national priorities, such as universal education and health care; visit schools, museums, cultural and historical sites; discuss with Cubans the effects of recent changes in U.S. and Cuban relations including the longstanding U.S. embargo on Cuba; learn about Cuba’s history of sugar production and slavery; and experience the sights, sounds and tastes of old Havana, its neighborhoods, and the surrounding countryside. An information session on this intensive international learning experience will take place at 5 p.m. Nov. 30 in McClain Hall 209. 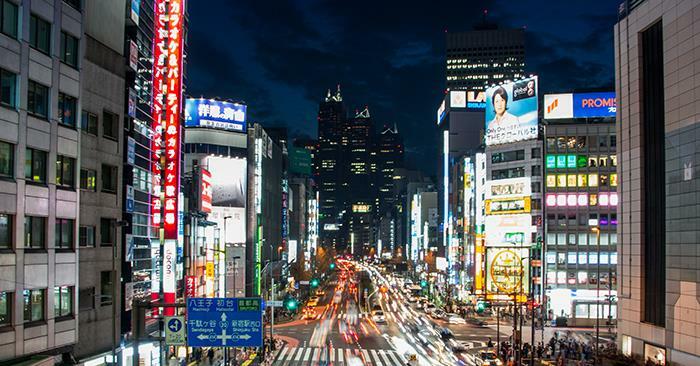 Students can earn one credit for this study abroad experience (CUB 310). The course is open to all majors and has no prerequisites. It runs parallel to Latin American Revolutions (HIST 391), but enrollment in that class is not a requirement. Applications and a $350 non-refundable deposit are due by Jan. 19. For more information and an application contact Marc Becker, McClain Hall 227, 660.785.6036. Hena Ahmad, professor of English, will present “The Beloved Witness: Agha Shahid Ali and Kashmir” at 7 p.m. Nov. 30 in the Baldwin Hall Little Theatre as part of the Global Issues Colloquium. 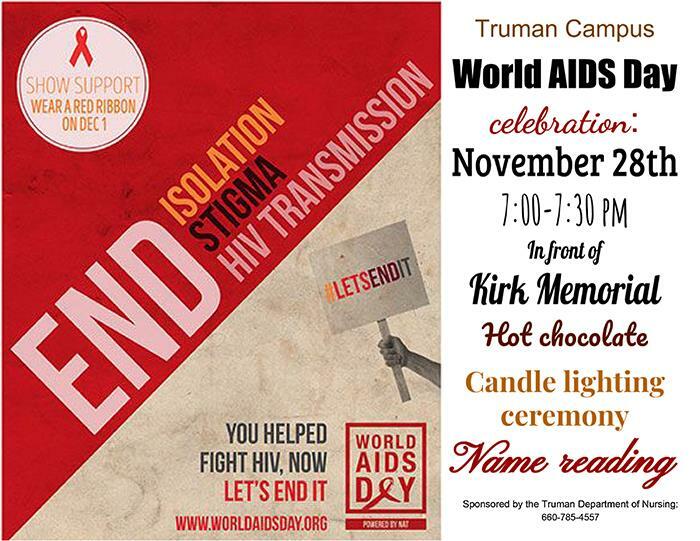 The public health nursing class is sponsoring a World AIDS Day ceremony from 7-7:30 p.m. Nov. 28 at the eternal flame in front of Kirk Memorial. Pickler Memorial Library will conduct its annual Food for Fines drive from Nov. 27 through Dec. 11. For every food item donated, $1 in fines will be waived. 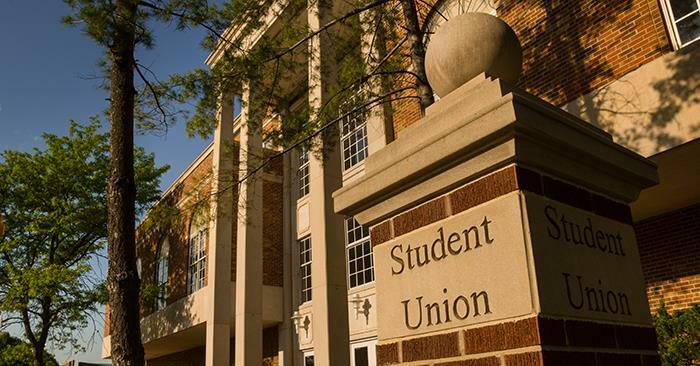 The University Board of Governors will meet at 1 p.m. Dec. 2 in the Student Union Building Conference Room. A tentative agenda is available on the Board of Governors website. The finalists for the position of vice president for student affairs will be on campus for open forums. A vitae for each candidate can be found on the search website at vpsa.truman.edu. Walk-ins are welcome, or click here to schedule a donation time. Truman, in partnership with the Wiesbaden School of Business in Wiesbaden, Germany, offers a unique student exchange program that allows Truman students to take business courses while abroad. Located in the heart of the Rhine-Maine area, one of Europe’s most dynamic business and cultural centers, the Wiesbaden School of Business offers courses in business administration, international business, accounting and taxation law, and insurance and finance. German language courses at all levels are also available. All business courses are taught in English. Being an exchange program, students will pay Truman tuition directly to Truman. This makes payment easy and affordable. Students are responsible for paying Wiesbaden University directly for all housing costs. There are two dormitories in Wiesbaden to pick from as well as the option of making private accommodations. For more information and how to apply, contact the Center for International Education Abroad, Baldwin Hall 106, 660.785.4076, ciea@truman.edu. 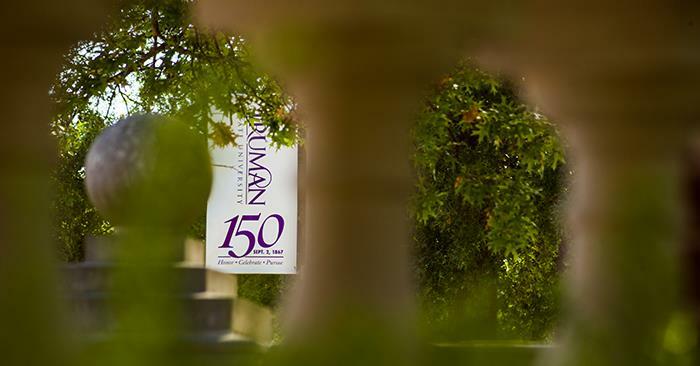 Truman’s Ronald E. McNair Program will host a celebration of achievement in recognition of its graduating seniors and new scholars at 5 p.m. Dec. 6 in the Student Union Building Alumni Room. In an effort to provide some relaxation during finals week, the Wellness Zone will be offering free three-minute massages and holiday coloring pages from 7-9 p.m. Dec. 11. 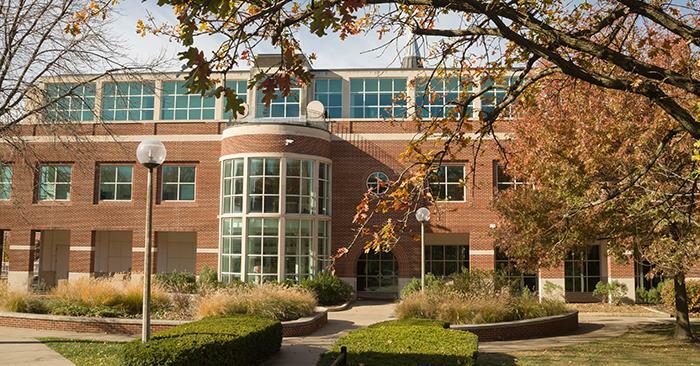 Located on the first floor of Pickler Memorial Library, the Wellness Zone provides a stress-free environment on campus where students, faculty and staff can relax and practice stress management techniques. Massage chairs, coloring, games and puzzles are all available whenever the library is open. In addition to Truman’s sesquicentennial, A.T. Still University is honoring 125 years, and the city of Kirkville is marking 175 years. A limited number of T-shirts commemorating the anniversaries are available for purchase in McClain Hall 202. Cost is $8 for 2XL and 3XL. Cash or check transactions only. Four Bulldog football players earned first team All-Great Lakes Valley Conference and 10 players overall were honored by the league following the 2017 season. Named to the first team were: senior offensive lineman Matt Kaysinger; senior defensive back Jordan Brown; junior kick returner Malique Robbins; and sophomore defensive end Sam Reeves. Second team honors were awarded to: senior linebacker Justin Mikeworth; sophomore running back Jordan Salima; and freshman full back Jacob Morris. Senior defensive end Isaiah Hinton, junior tight end C.J. Brown and sophomore linebacker Bryan Edwards were honorable mentions. In addition, sophomore quarterback Jaden Barr was the team’s nominee for the James R. Spaulding Sportsmanship award, and the team earned the overall Spaulding Sportsmanship award for the third straight season. Four Bulldog volleyball players earned All-Great Lakes Valley Conference honors for the 2017 season. Senior Jasmine Brown and sophomore Lauren Wacker were named to the first team while juniors Natalie Brimeyer and Savvy Hughes were featured on the second team. Zach Fischer was named the Great Lakes Valley Conference Men’s Basketball Player of the Week, Nov. 13. Fischer averaged a double-double with 20 points, 10 rebounds, 2.5 steals, and 2.0 assists per game while shooting 77.8 percent (14-for-18) from the field and 80 percent (4-of-5) from behind the arc. Barry Poyner, professor of communication, presented a program and presented a paper at the National Communication Association in Dallas, Texas, Nov. 18, entitled “Civility Be Damned: Measuring Conflict through Obstructionist Parliamentary Motions.” His paper focused on “Filibusters and Intellectual History.” Poyner also chaired a program, Nov. 16, for the Peace and Conflict Communication Division titled “The Relevance of Theory: Examining Intractable Conflict.” Poyner serves as parliamentarian for the national organization. 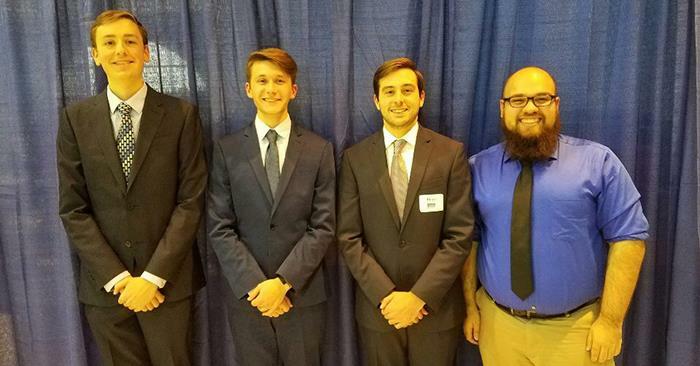 Truman students John Bickel, Stephen Plassmeyer, Peter Windsor and Zachary Smith gave research poster presentations at the 9th Annual ATSU Interdisciplinary Biomedical Research Symposium, Nov 11. Bickel, a senior chemistry major, presented his research investigation for potential inhibitors of HIV’s Viral Infectivity Factor (Vif) protein. Plassmeyer, a senior biology/chemistry double major, presented on the inhibitory capability of biflavanoid molecules on the aggregation of Amyloid Beta peptides, biomolecules associated with Alzheimer’s Disease, which is part of an on-going collaboration with Dr. Henry Han at ATSU. Windsor, a junior chemistry/exercise science double major, presented on his computational drug discovery project on the Zika Virus Protease enzyme. Smith, a sophomore biology/chemistry double major, presented his research on potential inhibitors for the enzyme APOBEC3B, which is known to be over expressed in both cancer and HIV patients. Windsor won the Sigma XI award for Best Undergraduate Research Poster presentation, and Plassmeyer won the Sigma XI award for Best Overall Research Presentation. Both awards came with a certificate and monetary compensation courtesy of Sigma XI. Bill Miller III, assistant professor of chemistry at Truman, served as their research supervisor and accompanied them at the conference. These students will be continuing their research projects during the academic year in the Miller Research Lab. Pictured from left to right: Zachary Smith, Stephen Plassmeyer, Peter Windsor and John Bickel. The Truman State University Foundation has applications for 2018 Study Abroad Foundation Scholarships available now. These are scholarships established by generous alumni and friends of the University. 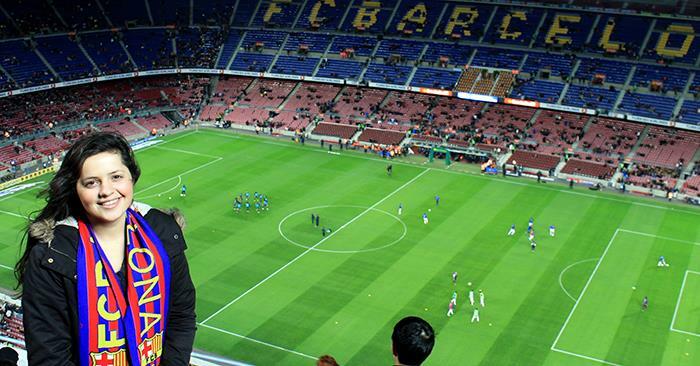 Scholarships are for students studying abroad through a Truman-sponsored program. To apply, log in to TruView, go to the Student Tab, Student Finances, Foundation Scholarship Application. Applications can be revised any time prior to the Jan. 31 deadline. Macquarie University offers a new exciting scholarship opportunity for students interested in studying abroad in Australia. Students who wish to experience Australian culture through a study abroad program at Macquarie University are eligible to apply for the Macquarie University Study Abroad Scholarship. Under this scholarship, Macquarie University will provide up to AU $1,000 to each successful student as a payment applied toward the student’s study abroad tuition fee. There will be in total 15 successful candidates every semester. Applications for semester 1, 2018 close Nov. 30. To apply, visit the Macquarie University website. For more information on Macquarie University, the programs they offer, and how to apply to Macquarie, visit the CCIS website. Additional details and assistance can be provided by Truman’s Center for International Education Abroad, Baldwin Hall 106, 660.785.4076, ciea@truman.edu. The Rainbow Scholarship will be awarded to a deserving LGBTQI student who aims to participate in a high-quality, rigorous education abroad program. This scholarship is made possible by the generous support of a group of international education professionals who are committed to advocating on behalf of LGBTQI students. Being a scholarship promoted by the Fund for Education Abroad (FEA), students who plan to study abroad for a full academic year (2018-19) could receive up to $10,000; $5,000 for students who plan to study abroad during the fall (2018) or spring (2019) semester; and awards that are prorated by number of weeks in-country (with a minimum of $1,250) for students studying abroad during summer 2018. For more information on the Rainbow Scholarship, and others sponsored by the Fund for Education Abroad, visit fundforeducationabroad.org/rainbow-scholarship. To look at the different study abroad programs offered at Truman visit studyabroad.truman.edu/choosing-a-program/study-abroad-exchange-summerinterim. 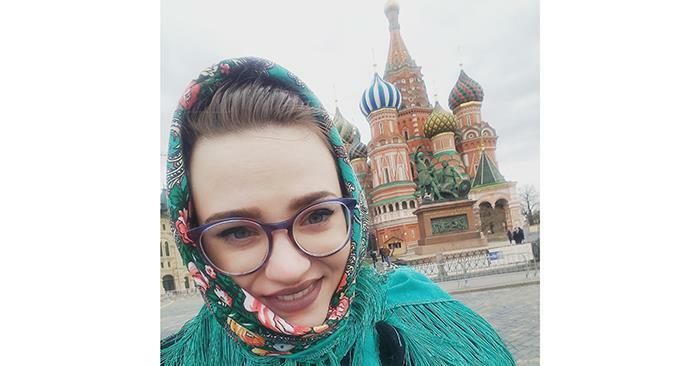 For more information and to apply to a study abroad program, contact the Center for International Education Abroad, Baldwin Hall 106, 660.785.4076, ciea@truman.edu.